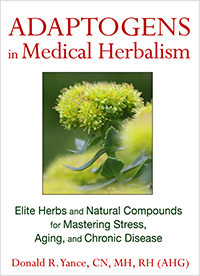 Inflammation is an essential part of our body’s immune defense. 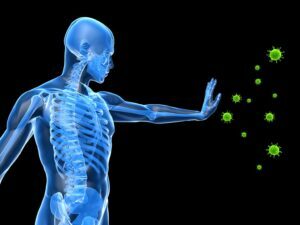 When we encounter pathogens such as bacteria, viruses, or parasites, our body responds with inflammation to fight the invaders and increase immune response. In these instances, inflammation is beneficial. But inflammation has a dark side—left unchecked, it can wreak havoc on cells, tissues, and organs. For example, it’s well established that chronic inflammation is a powerful force in the initiation, growth, and spread of cancer. There are three essential points to consider: First, a chronic inflammatory state can, over time, initiate cancer development. 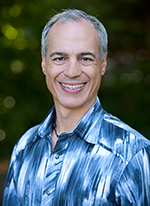 Second, we still need to find the cause of the chronic state of inflammation—for example, pathogenic (chronic infection), life-style, stress, years of poor eating, or a combination of the above. And third, it is important to keep in mind that the cancer energy, as it gains in intelligence, manipulates our immune system, creating a cancer-favorable, pro-inflammatory micro-environment. Research indicates that the systemic manifestations of inflammation can provide a valuable biomarker for prognosis and treatment stratification. Numerous studies indicate that a simple indicator of systemic inflammation—based on neutrophilia and/or lymphocytopenia—can provide prognostic information in a wide range of cancer types. In particular, the value of one index (the dNLR) derived from total white cell and neutrophil counts, is enabling large retrospective studies to be carried out. 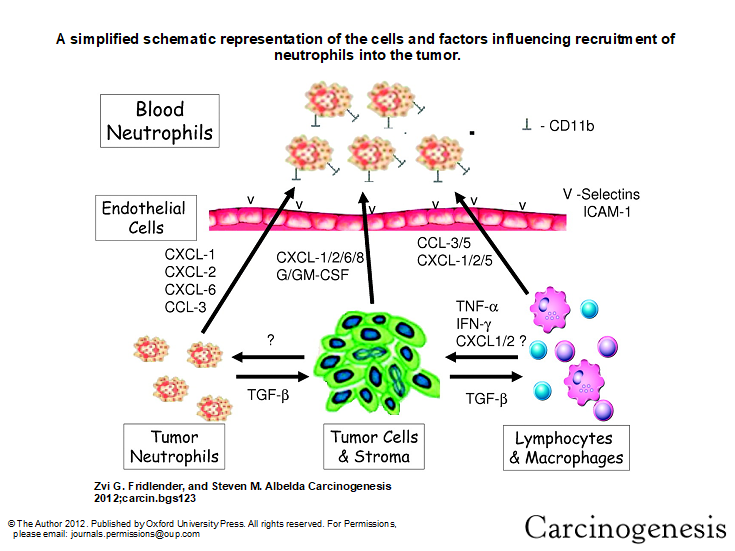 Tumor-associated neutrophils (TAN) play a major role in cancer biology. Neutrophils are the most abundant circulating leukocyte in humans, and are phenotypically plastic. Neutrophils, as a key component in inflammation, often play a crucial role in inflammation driven tumorigenesis. TAN can take an anti-tumorigenic (what we are calling an “N1-phenotype”) versus a pro-tumorigenic (“N2”) phenotype. 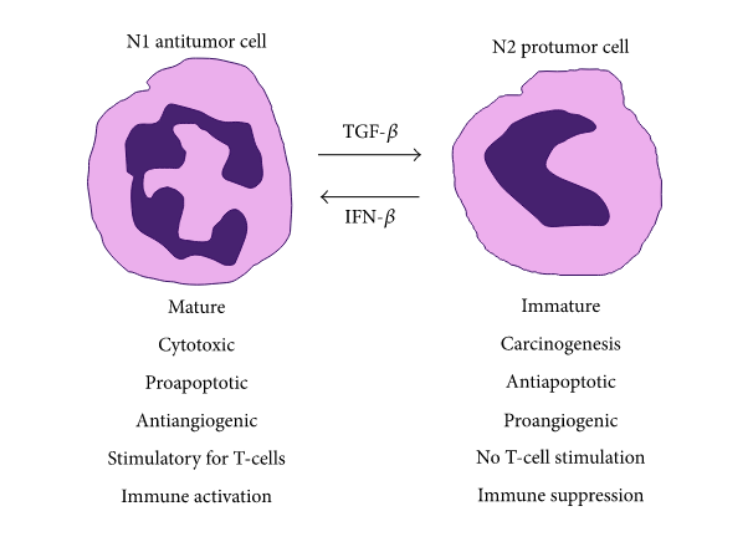 The anti-tumor activities of N1 TANs include expression of more immuno-activating cytokines and chemokines, lower levels of arginase, and more capability of killing tumor cells. N2 neutrophils are pro-tumorigenic, and secrete T2 cytokines. Studies have demonstrated specific examples of tumor-mediated signals (such as transforming growth factor-β) that induce the formation of a pro-tumorigenic (N2) phenotype capable of supporting tumor growth and suppressing the antitumor immune response. However, there are also studies showing that TAN can also have an anti-tumorigenic (N1) phenotype. Neutrophil function in cancer is dictated by environmental cues. Neutrophils may be divided into N1 antitumor and N2 pro-tumor cells. TGFβ is a potent driver of the transition from N1 to N2 phenotype whereas IFN-β is a potent driver of the transition in the opposite direction. This exemplifies the notion that neutrophil function in cancer is determined by the chemokine milieu in the microenvironment. The neutrophil to lymphocyte ratio (N/L ratio) appears to be related to the prognosis of various types of cancer. If the patient is not progressing, and has not had radiation, it could be part of the constitutional makeup of the patient; perhaps reflecting a low-grade chronic viral stress upon the immune system. If it is the cancer, then we must consider immune-therapy to trick the immune system into fighting in order to activate the proliferation of the lymphocytes. 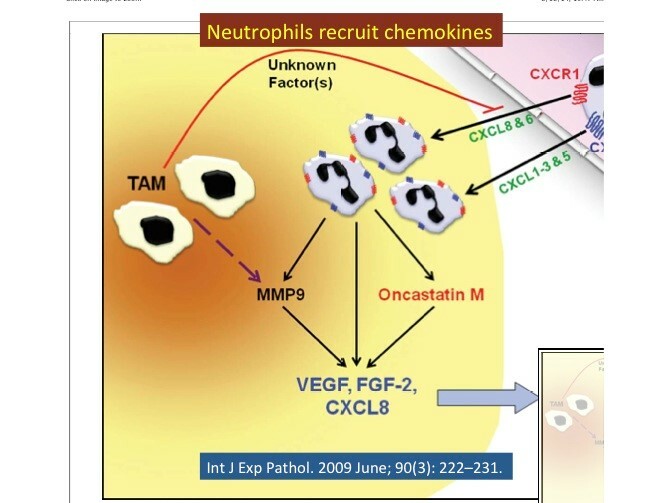 Neutrophils are recruited into the tumor via the production of chemokines for CXCR1 (CXCL8 & 6) and ⁄ or CXCR2 (CXCL1–3 & 5). Once inside the tumor, neutrophils can secrete factors such as oncostatin M, which stimulates tumor cells to increase vascular endothelial growth factor (VEGF) production. Neutrophils also secrete tissue inhibitors of metalloproteinase (TIMP)-free matrix metalloproteinase (MMP)9 that act in concert with MMP9 released by tumor-associated macrophages (TAMs) to liberate pro-angiogenic growth factors (VEGF & FGF-2) sequestered to the extracellular matrix (ECM). Cytokine-activated neutrophils also secrete VEGF and CXCL8 by de-granulation. These potent pro-angiogenic factors then act directly on the nearby vasculature to promote tumor angiogenesis. In addition, the interaction of neutrophils with adhesion molecules (ICAM-1) on the endothelial cell surface may also stimulate angiogenesis. Inflammation is clearly a “hot” topic in the field of cancer research, and for good reason. In my next post, I’ll share some of the compelling current studies on this crucial topic. Balta S, Cakar M, Demirkol S, Arslan Z, Akhan M (2013a) Higher neutrophil to lymhocyte ratio in patients with metabolic syndrome. Clin Appl Thromb Hemost 19(5): 579. Stotz M, Gerger A, Eisner F, Szkandera J, Loibner H, L Ress A, Kornprat P, A Zoughbi W, Seggewies FS, Lackner C, Stojakovic T, Samonigg H, Hoefler G, Pichler M (2013) Increased neutrophil-lymphocyte ratio is a poor prognostic factor in patients with primary operable and inoperable pancreatic cancer. Br J Cancer 109: 416–421. Szkandera J, Absenger G, Liegl-Atzwanger B, Pichler M, Stotz M, Samonigg H, Glehr M, Zacherl M, Stojakovic T, Gerger A, Leithner A (2013) Elevated preoperative neutrophil/lymphocyte ratio is associated with poor prognosis in soft-tissue sarcoma patients. Br J Cancer 108: 1677–1683. Demirkol S, Balta S, Celik T, Arslan Z, Unlu M, Cakar M, Kucuk U, Demirbas S, Iyisoy A, Yokusoglu M (2013) Assessment of the relationship between red cell distribution width and cardiac syndrome X. Kardiol Pol. 71: 480–484. Demirkol S, Balta S, Unlu M, Yuksel UC, Celik T, Arslan Z, Kucuk U, Yokusoglu M (2012) Evaluation of the mean platelet volume in patients with cardiac syndrome X. Clinics (São Paulo, Brazil) 67: 1019–1022. Cakar M, Sarlak H, Balta S, Unlu M, Demirbas S, Demirkol S (2013) Serum uric Acid still carries controversies about its role in endothelial dysfunction. J Clin Hypertens (Greenwich) 15: 296. Balta S, Demirkol S, Cakar M, Arslan Z, Unlu M, Celik T (2013b) Other Inflammatory Markers should not be forgotten when assessing the neutrophil-to-lymphocyte ratio. Clin Appl Thromb Hemost e-pub ahead of print 23 April 2013 doi:10.1177/1076029613486019. Balta S, Demirkol S, Celik T, Kucuk U, Unlu M, Arslan Z, Balta I, Iyisoy A, Kocak N, Haqmal H, Yokusoglu M (2013c) Association between coronary artery ectasia and neutrophil-lymphocyte ratio. Angiology e-pub ahead of print 17 March 2013 doi:10.1177/0003319713480424. Limaye AR1, Clark V, Soldevila-Pico C, Morelli G, Suman A, Firpi R, Nelson DR, Cabrera R. Neutrophil-lymphocyte ratio predicts overall and recurrence-free survival after liver transplantation for hepatocellular carcinoma, Hepatol Res. 2013 Jul;43(7):757-64. doi: 10.1111/hepr.12019. Epub 2012 Nov 30. Any research about leukemia, when there is neutropenia? I’m wondering how much the role of neutrophils and systemic inflammation in colon cancer might in part due to gut inflammation and immune activity due to food intolerances, leaky gut, poor diet with low fiber consumption and dysbiosis? Great article, thanks. Are auto antibodies lymphocytes? Do they play a role in inflammation/ cancer connection?